Clarendon JBBP’s Japanese language instruction is based on a nationally recognized model called FLES (Foreign Language in Elementary Schools). Our model is called T-FLES (teacher-led) because all of our classroom teachers deliver the Japanese language instruction. Curriculum coordinators who are native Japanese speakers also support our program. One of their primary roles is to support the teachers’ needs in language resources, curriculum development, and cultural events. 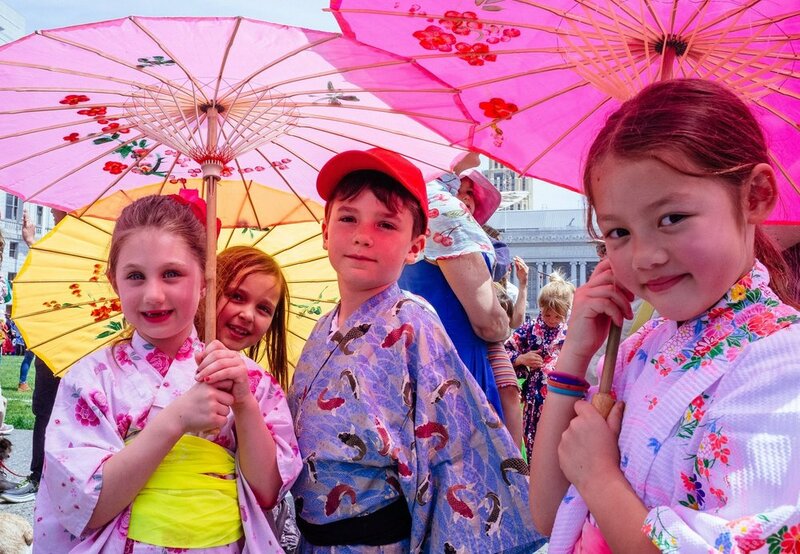 Their second primary role is to support the students’ participation in Japanese community activities (Cherry Blossom Parade, Children’s Day, Japanese Speech Language Contest, taiko performances). The Japanese curriculum is divided into 5 thematic units, aligned with the ACTFL (American Council of Teachers of Foreign Language) and the California Stare Foreign Language Standards. Central to the five units is the use of everyday language in reading, writing, listening, and speaking. Students receive approximately 2.5 hours of Japanese instruction per week and are encouraged and given multiple opportunities to use the language throughout each day. The use of the language throughout the day is a unique feature of our program and enables students to learn more functional or situational Japanese in a meaningful context in their daily lives. Along with helping Japanese Americans and Japanese students stay connected to their heritage and maintain their language skills, our goal is to help all students love the language and the culture. To make the Japanese lessons fun and meaningful, teachers use songs, interactive games, and skits along with the more traditional form of learning. The students learn how to order and receive food from a local restaurant, and participate in pen pal exchange with students at Lincoln High School. Culture is an integral part of the Japanese instruction. Clarendon JBBP introduces students to various aspects of both contemporary and traditional Japanese culture. Clarendon JBBP partners with the Consulate General of Japan in San Francisco as well as local Japanese American community to provide rich cultural education to its students. A list of scheduled cultural activities is posted on our Events page.